Time to find out more about Debby’s chosen subjects. Thanks for having me over here today Sal. It’s always a pleasure to be featured on your esteemed blog. Tell us about your genre of books that you write and why. I’ve always been a ‘tell it the way it is’ kind of girl. In fact, I’m pretty sure I should have been a reporter. I’m a nonfiction/memoir writer and no matter how hard I try to get around that by dabbling into the odd fiction writing piece, it always seemed I was writing on factual incidents, so I decided why bother packing it as fiction, why not just own up to it and tell the truth. All my stories have lessons in them that others can take from them. And when a story isn’t about a serious topic, I’ll always try to inject humor whenever I can. Why? Because sometimes we all just need to look for the funny. Seriously? I could write another book with my adventures and mishaps of self-publishing, but I’ll share a few here. Before I began writing my first book, I spent a year trying to learn the business of publishing. I signed up for many newsletters from some of the pioneers in the biz to learn the essentials about how editors worked, what formatting entailed, the importance of good, professional book covers, and marketing. I was overwhelmed to say the least but my passion to write books was stronger than my fear of the publishing process. Through the course of writing and publishing 6 books, I learned a lot about what makes a good book cover, a painful lesson on hiring the wrong editor, what a properly formatted book entails (without learning the actual process of formatting myself, but I give good directives, lol), and the importance of sharing, caring and giving back where I can. I am humble. And I never forget how intimidating it was for me to publish my first book and the people who reached out to give me great advice and a helping hand when I was eager to learn and grateful for any help anyone could offer me. That help came in ways of suggestions for editors, formatters, cover artists, promotional opportunities and friendships I slowly made along the way with other writers who had generously given of their time to help me solve many dilemmas along the way. I enjoy quite a few genres of music, depending on my mood. It’s funny, there was a time in my life where music was always on wherever I went – home or otherwise, until the writing bug set in and I can’t concentrate with any distractions including music. But when I do listen I love 70s music the most. Oh, I enjoy pop music from all decades, but something about the music of some of the great musicians from that decade just make me want to sing – The Eagles, America, The Guess Who, ELO, Earth Wind and Fire, well you get my drift. But I also happen to love R & B, and preferably tunes from the 80s and 90s in that genre. And these last few years I’ve also become a big Country and Western fan. I think that grew along with my love for the Southwest USA – Luke Bryan, Sam Hunt, Lady Antebellum, Vince Gill, Tim McGraw and many more. Tell us about your WIP, plans for your blog and any special events coming up. I wrote a post in January, outlining my plans for what I intend to share on my blog this year. These are my plans so far. As we all know, plans can change, but intentions are good, and plans help us be accountable. I’m also hoping to get involved in some Podcasting to expand my authorly horizons. And I think it’s time to venture into some freelance writing to supplement income. As far as book writing goes, I’d like to take a year off publishing another book because it eats up a good few months of my time doing so, and I want to explore new marketing avenues and activities to engage my readers and followers. I say I won’t publish another book this year, but I don’t know if I believe myself, lol. Let’s just say I’ve started a new journal with some new book ideas. I think my next book will be geared more toward the self-help genre than memoir. And I really want to write a humorous book too, so this may be a combined effort. I have a rough outline of ideas only for a book on ‘The changes after the change’. Probably won’t be pretty, but hopefully, plenty of laughs. Thanks Debby for sharing your adventures in publishing which have resulted in some wonderful books, and also your plans for the future. Debby would be delighted to receive your feedback and any questions and I will be back on Wednesday to check out the comments. Thanks for dropping in.. Sally. This entry was posted in Book Promotion, Smorgasbord Open House and tagged Conflicted Hearts by D.G. Kaye, D.G.Kaye, Twenty Years: After "I Do" by Smorgasbord - Variety is the Spice of Life.. Bookmark the permalink. Ah yes, the big 70s bands – you can’t beat them! But then I suppose it’s the music of our teens that we remember the most. 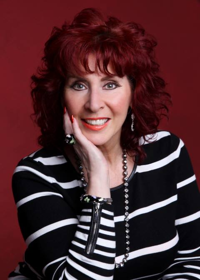 Thank you for allowing Debbie to provide some more insights into her life and work. She sounds like my kind of person. Super interview! I want to go along on that writing cruise! A great interview, Debby. Love the idea of a girls’ cruise but maybe meeting one day at the Bloggers’ Bash is more do-able. Not sure if I’ll get to it this year as I’ll just be back from my first ever visit to Canada. I htink the cat might leave home if I desert her again so soon. Ooooh, where are you going in Canada???? Toronto???? Inspirational blog post, Debby. I love the quotes. I always enjoy your posts, Debby. They are so honest and helpful. It is very encouraging. Debby, I’m going to Vancouver for my aunt’s 90th birthday. Although I know her I don’t know my cousins and their families – a whole tribe, it seems. My cousin is busy organising things to do and places to take me so I’m just going to go with the flow. Shame they are on the wrong side of the country. Great to read more about Debby in her own words, and I hope she gets to publish the book she is working on soon (it sounds fabulous!) Thanks, Sally and Debby. I enjoyed reading your writing plans. These always entertain me–we are all so different. I like the self-help sort of book and it goes well with your other answer which alludes to writing a self-help for self-pubbers. Lovely interview, Debby! It’s always nice to learn more about you. Good luck with your to do list. I look forward to reading your book after I finish up the current one I am reading. The new project sounds like an intriguing one for all women – the Change. Thank you, Sally. I’ve just met her as a blogger. She has an impressive set of gifts. A wonderful interview with Debby, Sally and lovely to learn more about her thoughts and writing! Debby, I’m all up for that girl’s cruise … a brilliant item on your bucket list and hopefully doable at some stage! 😀 I love the song and video, it’s so uplifting and moving. What a great interview, Debby. The thing about writing is that you never stop learning. You have some fabulous plans. I hope you get to a bloggers bash and a writer’s conference or two. These are in my plans too. My dad used to say, “The day we stop learning is the day we die.” He was wise like that. It still boggles my mind that you can crank out a book in “a few months”, Debby! That is so amazing. When you add the whole self-publishing adventure as well, I assume a book – from start to finish – takes about a year? Awesome, but that is what determined and focused writers do! I’m into my third year of writing my memoir and have only just begun with the second draft! Enjoy your year “off” and good luck focusing on other writing and blogging projects. Great interview! Thanks for inviting Debby, Sally!! Passion was stronger than the fear…love that, Debby! Lovely post from Debby, as usual, with lots of warm wisdom to share. The song with its advice to always stay humble and kind is a good one with advice that could have come straight from Debby.